This FINOX cuticle pusher by GERmanikure blends innovative design with modern high carbon stainless steel to make a cuticle pusher that will last. It is shaped to a smooth spoon-like shape and the extra hard steel combined with a matte, non-reflective finish makes for a tool that is a pleasure to use for both professionals and individuals alike. Raw high carbon stainless steel (surgical steel) is imported in bulk from Sweden specifically for use in GERmanikure's FINOX line; no other steel met GERmanikures requirements for consistency, hardness and durability. This rustproof steel is much harder than other types which mean the blade edges stay sharp longer. 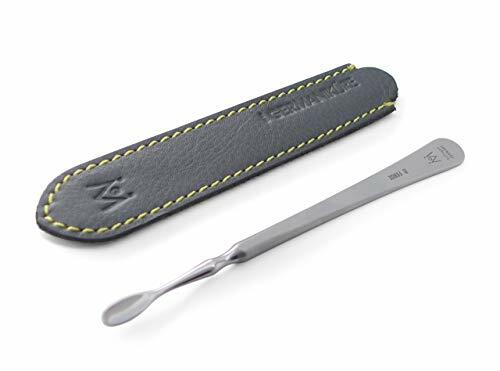 The GERmanikure cuticle pusher has a gentle curved spoon shape that is thin enough to press closely to the nail bed, but is smooth and curved enough so the tool will do no damage to delicate cuticle tissue. Even though this innovative tool is crafted of the finest modern materials and designed to last for decades, it comes complete with a custom fitted leather case to protect it even further. Leather is naturally cushioning and dehumidifying. The case will prevent damage to the tool when it is not in use as well as help wick away any condensation that may accumulate on the cool steel. GERmanikure believes in long tool life, healthful living, and good environmental stewardship. Each tool is handcrafted in Solingen, Germany by trained adult artisans in a factory that recycles leftover production waste and filters its wastewater. This item is guaranteed free from unethical workmanship such as forced labor or child labor. Do not allow tool to remain in liquids or autoclave for extended periods of time. HIGH CARBON STAINLESS STEEL - As strong as high carbon steel, as rust-free as stainless. Autoclavable, sterilizable & durable. LIFETIME WARRANTY - Guaranteed against manufacturing defects for life when you buy from Zamberg. Beware imitations sold by other companies! FREE LEATHER CASE - A free custom fitted leather case is included for protection when not in use. If you have any questions about this product by GERmanikure, contact us by completing and submitting the form below. If you are looking for a specif part number, please include it with your message.